Originally published under the title "Further Response to Roy Gutman: Balancing the Picture." Gutman's article uncritically relays dubious aspersions about the Syrian Kurdish People's Protection Units (YPG). See my initial response here. In his reply to my comments on his recent piece for The Nation, Roy Gutman takes exception to my supposed challenge to his "professional integrity." I should thus begin by emphasizing that I did not intend my piece to be calling professional integrity into doubt: opinions and definitions may differ, but for me doubts about professional integrity would only be an issue if I were accusing him of outright invention, deliberate and malicious manipulation of evidence or something similar. It is not my contention that he engages in any of these things, and such accusations must always be carefully considered before being put forward. Rather, a bias for a particular side, while problematic, need not have malevolent intent behind it. Bias can arise innocently and unconsciously. It can be driven, for example, by honest empathy and anger about the sufferings of civilians at the hands of a particular group or side. Gutman proceeds to complain that my assertions regarding his bias read like an attempt to "discredit the entire content" of his article. Such a reading of my response fails to take into account my prefatory point that Gutman raises some valid points for discussion. The fact that I talked about these points on a general level (e.g., in noting there are serious issues to be raised about displacement of Arab populations by the YPG) is not the same as not engaging with them at all. I even provided a link to a report by a human rights monitor to give examples of specific cases. Bias for a particular group or side need not have malevolent intent behind it. On the broader issue regarding the inference that I am supposedly attempting to discredit the entire content of the article, I should also add a clarification regarding the Seymour Hersh comparison: the point is not to claim that Gutman and Hersh are exactly equivalent (for one thing, as Gutman correctly points out, Hersh based his claims about the 2013 chemical weapons attack on anonymous former intelligence officials): rather, the point is that winning a Pulitzer Prize does not make one's reporting impervious to questioning. As it happens I don't believe Hersh is maliciously motivated in his biases either. But again, the idea is not to say that none of Gutman's claims merits being taken seriously. 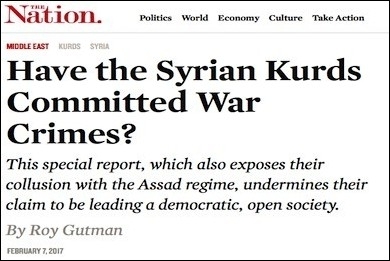 So, in response to Gutman's questions about whether abuses and war crimes have been committed by the YPG, the answer is yes, and that should not come as a surprise to anyone. There is regrettably little or no accountability on the ground in Syria for abuses and war crimes committed by all sides, and a comprehensive reckoning is unlikely to occur for the foreseeable future. YPG fighters at the funeral of three comrades killed fighting Islamic State. Thus, I do not have a problem with whether Gutman reports on bad aspects of the YPG, and the PYD party with which it is affiliated. I was taking specific issue with uncritical relaying of more dubious narratives that reflect lines promoted by Turkey and the Syrian opposition. In the case of his article for The Nation, I was touching in particular on the supposed IS-YPG collusion pattern. In this context, I should note that Gutman is upset about my reference to a 2012 article he wrote for McClatchy on the testimony of a claimed PKK defector, yet he does not address the specific problem I raised. It is certainly true that "obtaining the debriefing was an example of journalistic enterprise," as Gutman says. But journalists cannot simply relay debriefings and intelligence reports without appropriate critical scrutiny, as we have seen happen all too often in recent times with cases like U.S. intelligence reports in the run-up to the Iraq War, and even more recently the raw intelligence dossier on the alleged Trump-Russia connections and supposed dirt the Russians have on Trump that can be used to blackmail him. 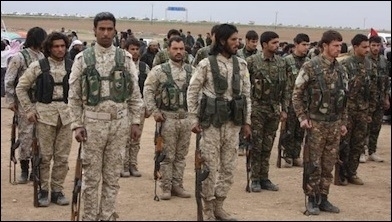 The claim that Kurds are heretics and apostates is a common Islamist talking point. In a similar vein, the debriefing Gutman reported on has sensational allegations regarding PKK approaches towards religion. As I have already pointed out, the association of Zoroastrianism with fire worship is a calumny against the Zoroastrian religion. To relay the allegations without critical comment is irresponsible, considering the historical persecutions of Zoroastrians by Muslims and that a common Islamist militant talking point against the PKK and "Kurdish militias" is that they are heretics and apostates. Undoubtedly there are some PKK and YPG members who could not care for religious belief and/or are completely secular, but what evidence is there besides the testimony of this debriefing that the PKK and its sister affiliates promote Zoroastrianism and teach fire worship? * It was the fact that these claims were relayed by Gutman without appropriate consideration that made me see a reflection of bias at work (again, I should stress, not necessarily malicious in intent). Turning more specifically to the contents of his article for The Nation, Gutman takes issue with my account of the fighting over the Tel Hamis area. In his response, he offers an account from a certain Abu Ahmad who says the YPG waited three days before entering without firing a bullet. Again, there is no problem in offering this account per se, but it also has to have the caveat analytical note that it is ultimately second hand, and an effort should be made to try to obtain other accounts for comparison (e.g. testimonies of YPG fighters, open source data from the time). As for what I wrote about Tel Hamis, on a technical note, I will begin by pointing out that Gutman is off the mark regarding some of the death notices I initially cited. Two of the death notices are for fighters killed in February 2015 prior to the 27th of that month: the Australian , and if he reads the original posts more closely, Hussein Masoud's brother. Regarding my own wording, by "extended campaigns" I meant bouts of fighting that took place over multiple months in the wider area. One can criticise me for geographic imprecision, but it is important to remember in speaking of Tel Hamis that we mean not just the town/village by that name but also the wider area (cf. references in Arabic to mantaqat Tel Hamis and rif Tel Hamis). Of course, not every day meant intense clashes and battles. Indeed, in the Syrian civil war, much of what goes on in terms of engagements between various sides can appropriately be described as ribat (frontline maintenance etc.). On a given day there might be no fighting at all: a mere gunshot or two and/or firing mortar rounds. Then a flare up may occur. In relation to the Tel Hamis area, one example of a flare up occurred in September 2014, as the YPG launched an offensive that claimed the capture of multiple villages. During this flare up multiple YPG fighters were pronounced to be 'martyrs' . Here is another example of clashes reported in late December 2014 in the Tel Hamis area, with at least four YPG fighters reported to have been killed at that time. It may well be that when Tel Hamis as a town/village finally fell to the YPG in February 2015, there was no grand or major battle to accompany it. However, to overlook all that happened in the time between IS solely becoming responsible for that wider frontline against the YPG after it destroyed the rebel factions in Hasakah province and the YPG capture in February 2015 is painting a highly misleading picture. It is also highly misleading to overlook the prior rebel-IS cooperation against the YPG on that front, which resulted in many YPG fighters being killed in late 2013/early 2014. Thus it can be seen how the fighting between IS and the YPG in the Tel Hamis area reflects continuity. Likewise we must note the reports of fighting and casualties in the wider area that occurred following February 2015. I thus stand by my original 'travesty of the truth' comment, having elaborated more fully here what I meant. A somewhat similar case for what would constitute a misleading picture would be to note that the village of Dabiq fell out of IS hands without a grand final battle despite the village's symbolic importance to IS, while overlooking the long war of attrition that occurred between the rebels and IS prior to that, also featuring episodes of ribat and calm juxtaposed with flare ups. Or again, note the case of Jarabulus I mentioned in my previous piece. Journalists are supposed to make judgements that account for all evidence available to them. Can casualty figures and losses be exaggerated in reports? Of course. Yet the narrative of Gutman's sources paints a very implausible picture that is designed to promote a line of some kind of IS-YPG collusion. To buy into it would mean supposing all those clashes etc. that occurred in the wider area over multiple months were a mere farce/fabrication. Thus, here we have an encapsulation of the job of journalists and analysts: weigh up the contrary accounts and try to come to a judgement that accounts for the various lines of evidence available. In the specific case of the Tel Hamis area village of Husseiniya mentioned by Gutman, who also points out that Amnesty International cited residents as saying that no clashes occurred in the withdrawal from that village, it is perfectly possible to accept that testimony, and the subsequent destruction of property by the YPG, without supposing a conspiracy of some kind as pushed by Gutman's sources. To bolster the collusion narrative, Gutman had cited in his original piece a certain Mudar al-Assad as saying that there are hundreds of examples of the YPG-IS pattern of the latter taking a village from rebels and then turning it over to the YPG without a fight. It would be interesting to see specific naming of those hundreds of cases, if that is really the case. 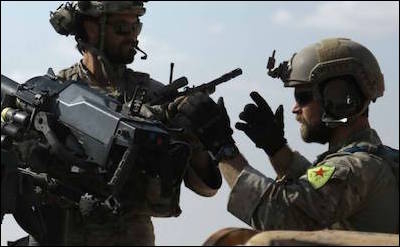 U.S. special forces in Syria commonly wore YPG patches out of solidarity with their Kurdish comrades-in-arms until ordered to stop last year amid complaints from Turkey. I draw the line here in this discussion. I stand by my initial assessment while reaffirming that I am not questioning Gutman's professional integrity. Similarly I reject notions of supposed anti-Kurdish prejudice on Gutman's part and other personal attacks on him. However, a serious debate about the YPG and its relationship with the U.S. must be based on reasoned consideration of the evidence, taking into account the benefits the partnership has brought in blunting IS while also noting the human rights abuses and the PKK connections and understanding why there are Turkish concerns. Looking forward, seemingly intractable land disputes similar to those we observe in Iraq between the Kurdish and Arab actors will mar the Syrian landscape for a long time even if IS were completely removed. There will be no easy resolution. While it is important to note the lack of evidence for the PKK promoting the Kurds' religion as Zoroastrianism and teaching fire worship, there is an interesting strand of thought within Abdullah Ocalan's writings that idealizes Zoroaster as a figure who promoted equality and care for nature, thus trying to link him to Kurdish ethnic and cultural heritage. This contrasts with a depiction of Islam as a vehicle of Arabism. On the other hand, Ocalan also wants to praise certain aspects of Islam, equating the rise of the religion historically with bringing about feudal system that constitutes an improvement over the supposed ancient slave civilization, while presenting Muhammad as a figure embodying revolution that becomes corrupted. These arguments, as Matthew Barber points out to me, partly reflect Ocalan's views of history according to his Marxist ideology and political worldview as well as a desire not to be too offensive to the pious sensibilities of fellow Kurds. In any event though, Ocalan is ultimately an atheist, and does not promote the idea that Kurds should practise the Zoroastrian religion and formally identify as Zoroastrians, let alone engage in fire worship, though some Kurds who do identify as Zoroastrians seem to be partly influenced by Ocalan's idealization of Zoroaster. The kinds of nuances in Ocalan's views and their impacts are obscured by silly polemic as conveyed by that supposed PKK defector.